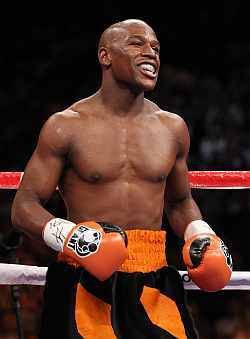 Floyd Mayweather Jr has been sentenced to 90 days in jail for assaulting his ex-girlfriend, Josie Harris in 2010. The 34-year-old U.S. boxer has also been ordered to pay a fine of $2,500 and complete 100 hours of community service. Mayweather agreed to a plea deal, meaning he will not have to answer felony charges of beating Harris and threatening two of their children. Prosecutors said Mayweather's history meant jail time was appropriate. "He just continually gets himself into trouble and he is able to get himself out of it as well," the BBC quoted prosecutor Lisa Luzaich as telling Judge Melissa Saragosa. "Essentially it is because he is who he is and is able to get away with everything. "The only thing that's going to get this man's attention is incarceration," Luzaich added. The judge said that she decided to jail Mayweather after he admitted hitting Harris and twisting her arm. After citing a police report, Saragosa said that two of the former couple's children, ages 9 and 10, also witnessed the attack, in which Mayweather threatened to make Harris "disappear". Mayweather has been told to report to jail on 6 January.